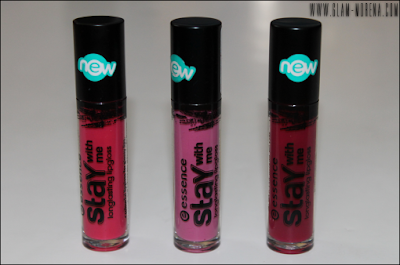 Glam Morena: Essence Stay With Me Long-Lasting Lipgloss. 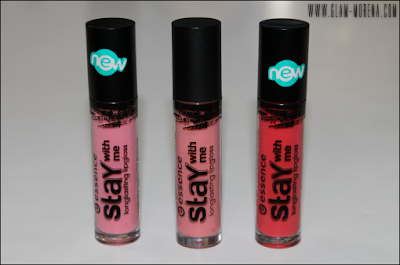 Essence Stay With Me Long-Lasting Lipgloss. 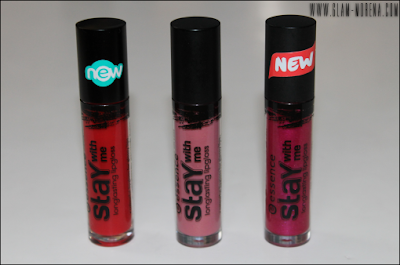 One of my favorite budget friendly lipglosses are the Essence Stay With Me Long-Lasting Lipgloss. Essence Cosmetics is a brand from Germany. It's available to those in the United States at Ulta stores and Ulta online only. My top five favorite Essence Stay With Me Long-Lasting Lipglosses are My Favorite Milkshake, Candy Bar, Trendsetter, I Like Cotton Candy, and Deep Rose. Essence Stay With Me Long-Lasting Lipgloss: Me & My Ice Cream, My Favorite Milkshake, Candy Bar, Trendsetter, I Like Cotton Candy, Berry Me, Kiss Kiss Kiss, Deep Rose, and Hottest Pink. Shade names are listed from left to right. Description: The name Stay With Me Long-Lasting Lipgloss by Essence says it all! The color-intense texture is so wonderfully creamy and durable that it's simply irresistible. It won't even leave a sticky feeling behind. The special shape of the precision applicator allows an effortless application. Trendy colors are waiting to make your lips pop! This lipgloss includes a very unique application wand! Swatches of all the Essence Stay With Me Long-Lasting Lipglosses! 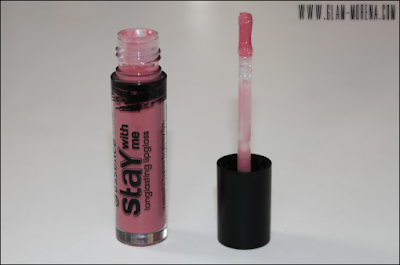 Have you tried the Stay With Me Long-Lasting Lipgloss? Favorites? Thoughts? Wow those look nicely pigmented! I have been wanting to try essence since I saw you blog about it awhile ago but I can't find it anywhere including my nearby Ulta. Are these as pigmented as the swatches or do they sheer out on the lips like E.L.Fs glossy gloss? I own Berry Me and Kiss Kiss Kiss, and I love them both! They're very comfortable and last much longer than my average gloss. They're also surprisingly pigmented! I love these Essence glosses! I've repurchases Me & My Ice cream & My favorite Milkshake thrice already... They are great! I have a few of them and I love them! Trendsetter is one of my favorites.